The reputation of a travel and tourism company depends largely on the desirability of the tourism destination it proposes. Sterling Holidays knows this fact, and is also aware of the competition the other players in the niche pose. Sterling Holidays have built a network of leisure resorts at some of the best holiday destinations in India. Hence the company invests a great deal in creating a strong brand for itself and the destination it sells, which is India. The latest in line is its India Unveiled campaign which it runs. The objective of the current campaign is to showcase the rich Indian heritage which makes India an ideal destination to explore. 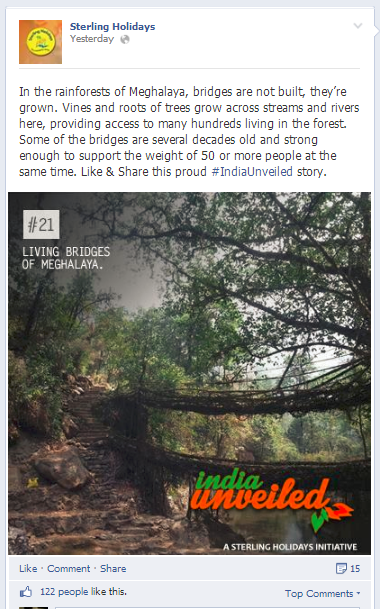 The campaign has been designed to feature one story a day, every day for 30 days through the month of October across Facebook, Twitter, Google+ and Pinterest to host its content which primarily promotes some known and unknown facts about India. 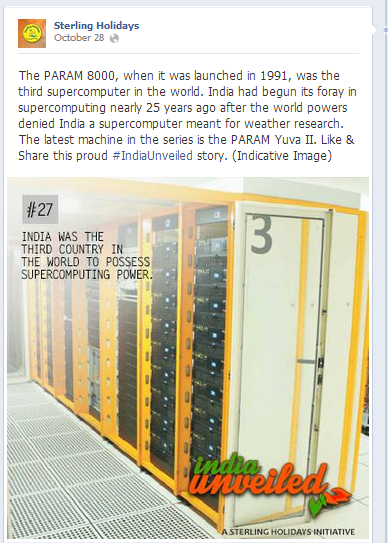 For example, one of the stories highlights PARAM 8000, world’s third supercomputer built by India. The content has been sourced from various places, as indicated by the Facebook page admin, in one of its responses (see the image below). The overall concept of the campaign is well thought out, and is in perfect sync with the business end of the company. 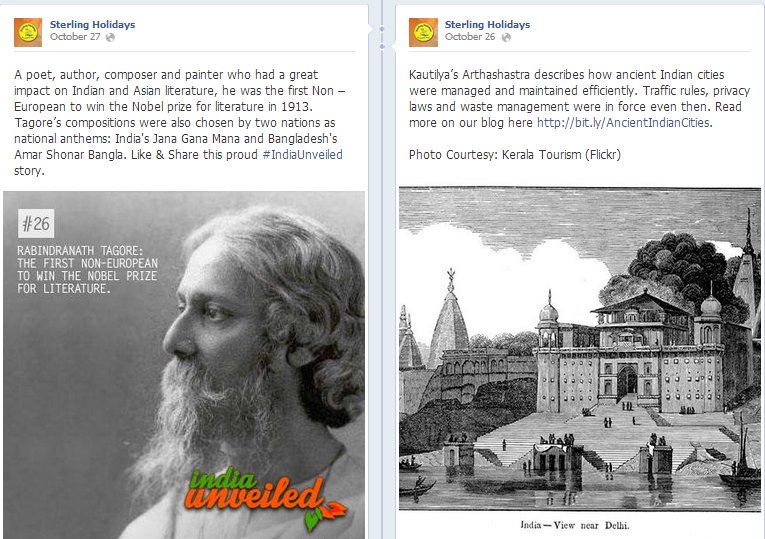 The campaign shares knowledge about India and the destinations in which Sterling Holidays operate. This will help them deliver a memorable holiday experience to their customers. Since it was a month long campaign, it created a meaningful impact for the brand within the minds of the consumer. The content shared is of interest to a large number of people, if not everyone. 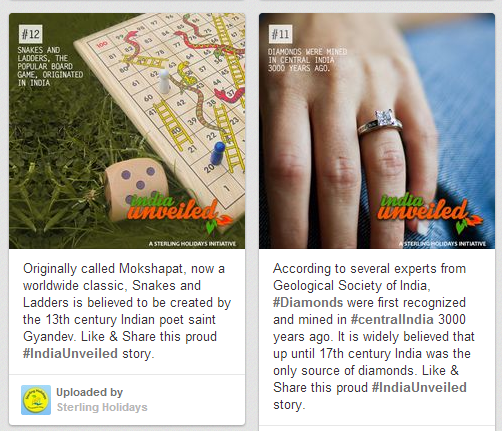 The social media team of Sterling Holidays has invested a great deal of time in collecting various facts and figures about India, an example of which could be seen in the following screenshot I took from its Pinterest profile. The tweets created by the social media team are crisper, and provide a gist of the facts it has shared in greater details on Facebook. Some images don’t exude the feeling of ‘wow,’ which has been communicated in long-but-informative copy. Pinterest is a visual medium, and pins with text that is a paragraph long does not interest users on this platform. Their updates on this platform should have contained only, if not more, visual elements. Sterling Holidays should have invested in creating custom content for this platform (which could have been used on Flickr as well, which has not been used) rather than using the same copy as Facebook. If there was enough leverage, the team could have created videos for YouTube as well. Seeing the nature of the campaign it is running, the content created for this would have been an asset for the company. They could have also used this campaign to drive traffic to their website. Although the brand has been blogging about some of these destinations, they are not linking it back to the Holiday Options by Sterling in those places. The concept was nice, but it has not been explored very much. Since it was a month long campaign, it did create a lot of impact. But I feel, they didn’t use the strength of different social media platforms to get the maximum mileage; instead, plain-Jane vanilla content was created and shared without much alteration on various platforms. I would say that the social media team lost its way in the difficult maze of tactical maneuvers during execution after creating a nice strategy to catch its audience’s fancy. The overall plan was nice, but the team fell way short in execution.